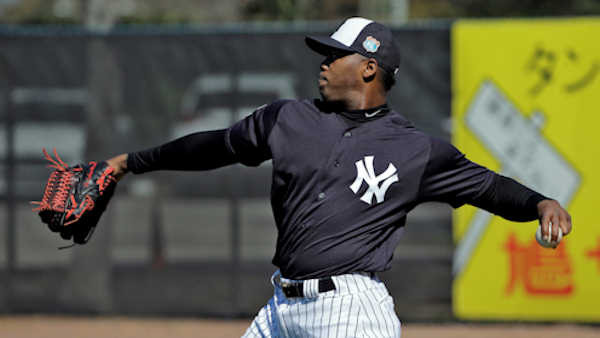 NEW YORK -- New York Yankees closer Aroldis Chapman agreed to accept a 30-game suspension under Major League Baseball's domestic violence policy, a penalty stemming from an incident with his girlfriend last October. Under the discipline announced Tuesday, Chapman will serve the penalty from the start of the season in April. He will lose 30 days of pay - $1,856,557 of his $11,325,000 salary - and 30 days of major league service, which will allow him to reach six years of service time after this season, enough to become eligible for free agency. "I found Mr. Chapman's acknowledged conduct on that day to be inappropriate ... particularly his use of a firearm and the impact of that behavior on his partner," baseball Commissioner Rob Manfred said in a statement. "I am gratified that Mr. Chapman has taken responsibility for his conduct." Chapman became the first player penalized a finite number of games under the policy, which MLB and the players' association agreed to in August following several high-profile incidents among NFL players. Colorado shortstop Jose Reyes was given an indefinite paid suspension last week, pending a trial scheduled for April 4, following an alleged altercation with him wife in October. Baseball's investigation of Chapman stemmed from Oct. 30. Chapman's girlfriend, 22-year-old Cristina Barnea, told police he pushed and choked her. Chapman said there was an argument but that he was pushed down by Barnea's brother, eventually getting a handgun and firing eight shots into a wall and window while locked in his garage. "I want to be clear, I did not in any way harm my girlfriend that evening," Chapman said in a statement. "However, I should have exercised better judgment with respect to certain actions, and for that I am sorry. The decision to accept a suspension, as opposed to appealing one, was made after careful consideration. I made this decision in an effort to minimize the distractions that an appeal would cause the Yankees, my new teammates and most importantly, my family." The players' association said it supported Chapman's decision to accept the penalty and said "its members do not condone the mistreatment of others by playing or non-playing personnel." "We need him," teammate Alex Rodriguez said Tuesday before the suspension was announced. "He's a big part of our team, and I think the key in New York is you have to focus on the game, focus on your teammates, and I think he has a lot of support in that clubhouse."